There were no surprises in Sunday’s finale at the 64th Vuelta a España: André Greipel kicked to his fourth stage victory to dominate the sprints and Alejandro Valverde secured the grand tour victory that eluded him up to now in his otherwise prolific career. 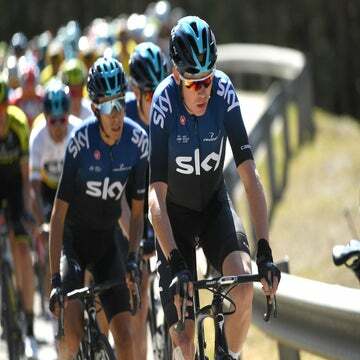 Columbia-HTC dominated the final charge to the line in the 110km stage from Rivas Vaciamadrid to seven circuits in downtown Madrid to stick a fork in the 2009 Vuelta. Greipel made easy work of Daniele Bennati (Liquigas) to win his fourth stage and the team’s fifth during the Spanish tour. 2009 Vuelta, stage 21: Valverde gets his first grand tour win. There were no surprises in Sunday’s finale at the 64th Vuelta a España: André Greipel kicked to his fourth stage victory to dominate the sprints and Alejandro Valverde secured the grand tour victory that eluded him up to now in his otherwise prolific career. Columbia-HTC dominated the final charge to the line in the 110km stage from Rivas Vaciamadrid to seven circuits in downtown Madrid to stick a fork in the 2009 Vuelta. Greipel made easy work of Daniele Bennati (Liquigas) to win his fourth stage and the team’s fifth during the Spanish tour. “I am really happy. I came here with a good lead-out team, with (Greg) Henderson and (Marcel) Sieberg were excellent giving me lead-outs. The team helped me survive the mountains and I was the lucky one to cross the line first again today,” said Greipel, who also won the points jersey. The win is Greipel’s 18th on a season derailed in January when he crashed out of the Tour Down Under. 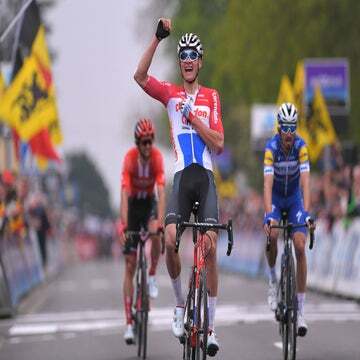 With victories now in both the Giro d’Italia and the Vuelta, Greipel said he’d like to race the Tour de France, but refused to speculate if there is going to be room on Columbia’s powerhouse Tour squad anchored by sprinter Mark Cavendish. 2009 Vuelta, stage 21: Greipel put his stamp on the Vuelta – Tour next year? After finishing among the top-5 four times, including two podium spots, Valverde finally wins the Vuelta. The 29-year-old rode differently during this Vuelta, with a focus on the larger GC battle at the expense of winning stages. Though he didn’t win a stage, Valverde was most consistent and the new strategy helped him claim his first grand tour victory during his career filled with wins in one-day and week-long stage races. Joining him on the podium are Olympic gold medalist Samuel Sánchez (Euskaltel-Euskadi), second at 55 seconds back, and Cadel Evans (Silence-Lotto), third at 1:32 off the pace. 2009 Vuelta, stage 21: Evans, Valverde and Sanchez on the podium. Evans overcame a disastrous puncture in the stage to Sierra Nevada to earn his third-career grand tour podium, to go along with back-to-back second places at the 2007-08 Tours de France. The Aussie rode to third in Saturday’s individual time trial to bounce ahead of Ivan Basso (Liquigas) to put a strong finishing note on his 2009 campaign. Garmin breakout: Garmin-Slipstream finally got the monkey off its back and won an individual grand tour stage. After 19 second and third places in grand tour stages dating back to the 2008 Giro, the U.S.-registered team broke into the winner’s column. Tyler Farrar earned his first career grand tour stage win in Stage 11, followed by a dramatic breakaway victory by Ryder Hesjedal in Stage 12 to earn Canada’s first ever Vuelta stage victory. David Millar earned his third career Vuelta stage win in Toledo’s time trial to complete the Garmin hat-trick. Dean’s list: Julian Dean (Garmin-Slipstream) earned his own spot in the history books by becoming the only rider to start and finish all three grand tours during the 2009 season. The veteran Kiwi brushed off a horrific crash in Stage 16 when he got his handlebars caught on the barriers and toughed it out to make it to Madrid. Cuesta record: Cervélo’s Iñigo Cuesta expanded on his mark of the most Vuelta starts with 16. The 40-year-old has a contract to race next season and promises to return to the Vuelta. Moncoutie extends: Cofidis climber David Moncoutie won Stage 13 en route to claiming the climber’s jersey. Defying rumors that he was set to retire, Moncoutie has signed a contract extension that will keep him in the peloton in 2010, though a Tour de France start seems unlikely. Xacobeo’s consolation: Unsung Xacobeo-Galicia proved they deserve a spot among the big boys, earning the team prize by more than 23 minutes. The Galicia-backed squad fell short on its bid to win a stage and Ezequiel Mosquera stopped short of the podium, finishing 5th at 4:27 back. World’s bound: The Vuelta once again proved a valuable proving ground for worlds-bound riders, who honed their form in the opening weeks of the Vuelta before packing it in early ahead of Mendrisio. Among the standouts include two stage victories apiece by Damiano Cunego (Lampre) and Fabian Cancellara (Saxo Bank). No North Americans in Madrid: Despite seven North Americans at the start line in Assen, including a record four Canadians, none of them made it Madrid. Chris Horner (Astana) suffered a horrible crash on wet roads in Liège. Farrar pulled out as planned after Stage 11. Dominique Rollin (Cervélo) succumbed to a cold, as did Tom Danielson (Garmin-Slipstream). Svein Tuft and Ryder Hesjedal (both Garmin) pulled out to prepare for the worlds and Christian Meier (Garmin) left for a family emergency. 2. Daniele Bennati (ITA), Liquigas, s.t. 3. Borut Bozic (SLO), Vacansoleil, s.t. 4. Leonardo Duque (COL), Cofidis, Le Credit En Ligne, s.t. 5. Sébastien Hinault (FRA), AG2R La Mondiale, s.t. 6. Enrico Gasparotto (ITA), Lampre-N.G.C, s.t. 7. Greg Henderson (NZL), Team Columbia-HTC, s.t. 8. Roger Hammond (GBR), Cervelo Test Team, s.t. 9. Tom Leezer (NED), Rabobank, s.t. 10. Paul Voss (GER), Team Milram, s.t. 11. Philippe Gilbert (BEL), Silence-Lotto, s.t. 12. Inaki Isasi (ESP), Euskaltel-Euskadi, s.t. 13. Jurgen Roelandts (BEL), Silence-Lotto, s.t. 14. Daniel Moreno (ESP), Caisse d’Epargne, s.t. 15. Kevin De Weert (BEL), Quick Step, s.t. 16. Christian Knees (GER), Team Milram, s.t. 17. Fabio Sabatini (ITA), Liquigas, s.t. 18. David García (ESP), Xacobeo Galicia, s.t. 19. Javier Benitez (ESP), Contentpolis-Ampo, s.t. 20. Dominik Roels (GER), Team Milram, s.t.